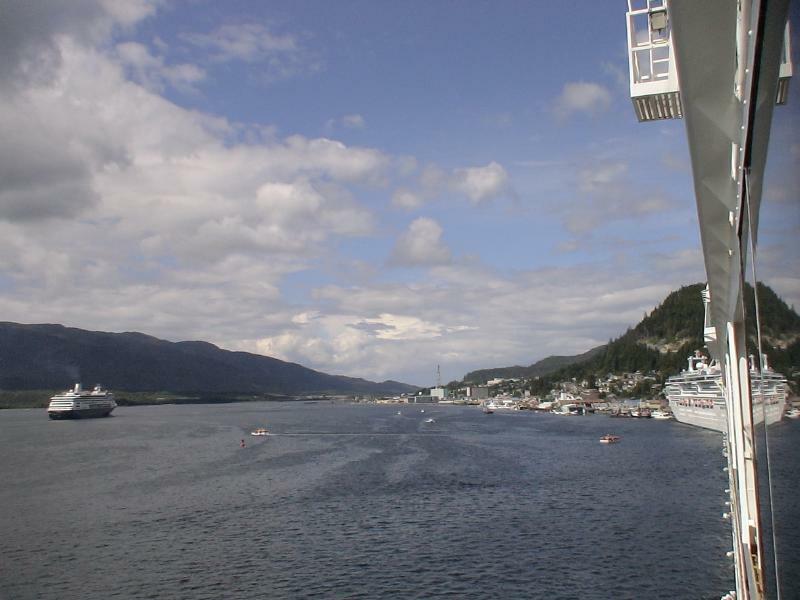 We took a cruise on the Norwegian Cruise Lines [NCL] from Seattle, up the inside passage as far north as Skagway via Juneau, Prince Rupert, Canada and Ketchikan. 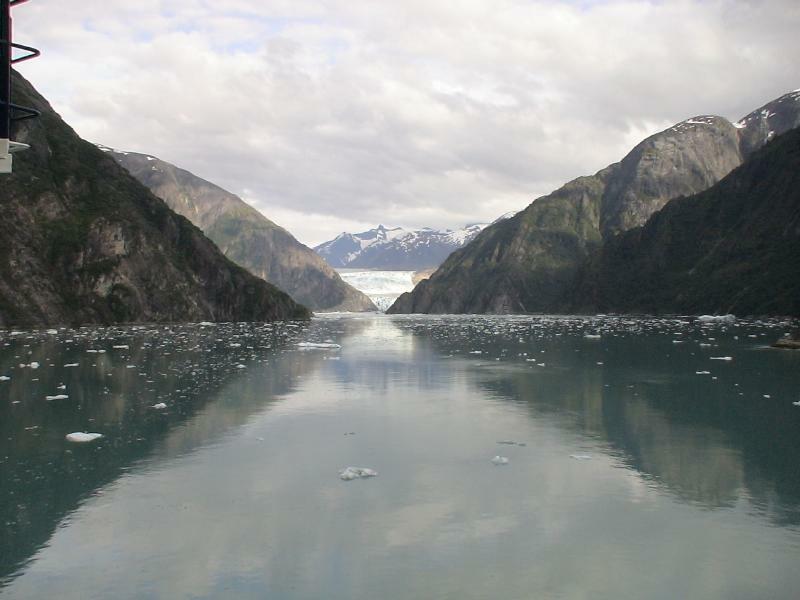 The trip also included a stop at the Sawyer glacier. 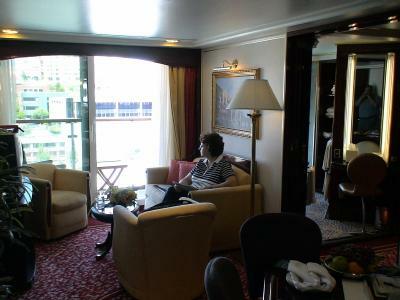 We had a suite on the ship that consisted of a sitting room, dining area, bedroom, shower, whirlpool and a balcony. Personally, I could have spent the entire cruise on the balcony. Our cabin was on the 10th deck and was about 120 feet above the water line. You can see the reflection of me in the mirror in the changing room as I was taking the picture. Just to the right of my reflection are two huge mirrored sliding closet doors that were part of a massive built-in wardrobe. Each door weighed easily several hundred pounds. All of the woodwork in the cabin was polished mahogany. As you can see, the entire outside wall of each room overlooked the ocean. Even the outside wall of the shower was glass. All of the cabin lighting was controlled by small switches discretely placed around the two rooms. There were master controls on each side of the bed...but it took us a few days to discover this and we stumbled around in the dark a lot the first few nights stubbing our toes. That first night at sea, we were lying in bed just about to fall asleep when we heard a loud creaking sound accompanied by a low massive rumbling sound ending in a huge crash. I sat up in bed thinking that the entire front of the ship had just been sheered off. I expected to hear alarm bells and screams but there was only silence. Not being able to find the light switch in the dark, I sat there waiting...... Nothing......... After a few minutes, I laid back down thinking that surely the crew on the bridge must have hear this cacophony of sounds. After a few minutes I drifted off to sleep again. Then the massive sound repeated itself. Creek! Rumble! Bang! This was getting troublesome! 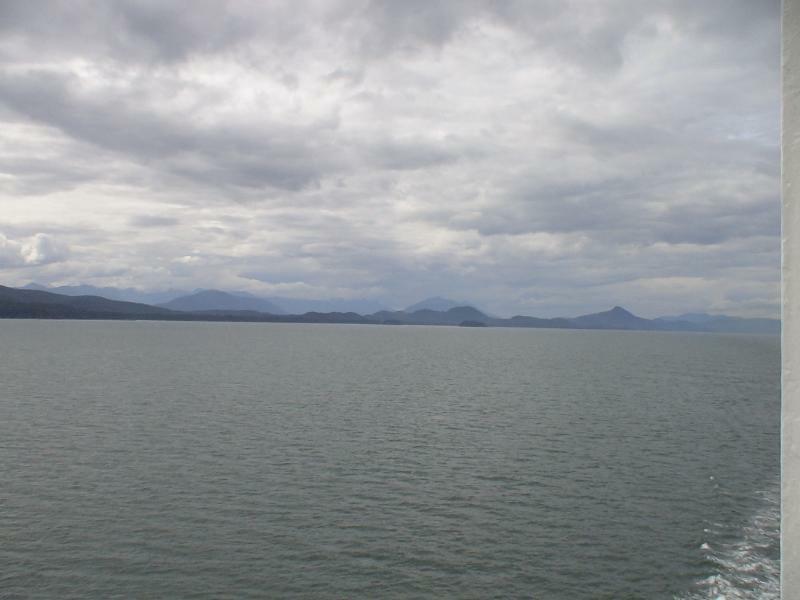 Were we the only people on the ship who were alarmed by these horrible sounds? 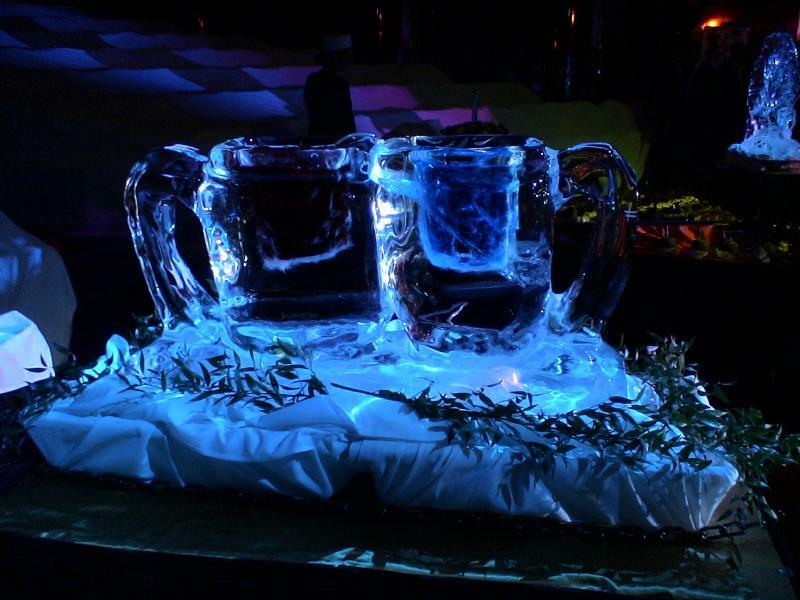 Would these phantom sounds be a nightly occurrence? Would the front end of the ship eventually fall into the ocean with us on board? I woke up to the sounds a few more times during the night. At daybreak, I heard the sounds again, but this time there was enough light in the cabin that I could see the cause. One of those massive rolling closet doors that I mentioned earlier had not been pushed completely shut in its track. Every time the ship pitched slightly while making a turn, the door would start rolling, gaining momentum, and bang into the closet end wall. The door would then bounce back rather than staying in the friction stop and would careen in the opposite direction when the ship made an obliging turn. 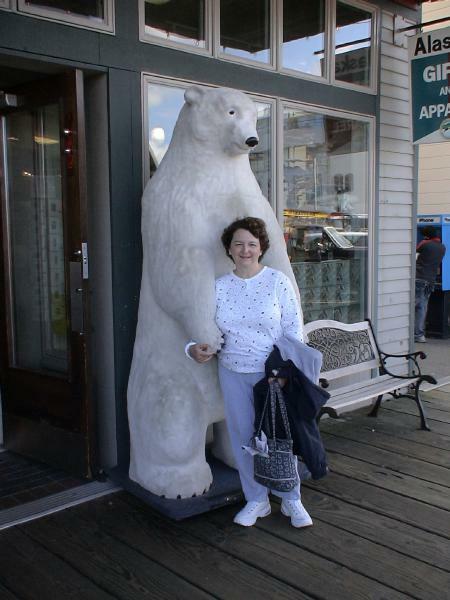 After the first night, we learned to completely close the closet doors before retiring! 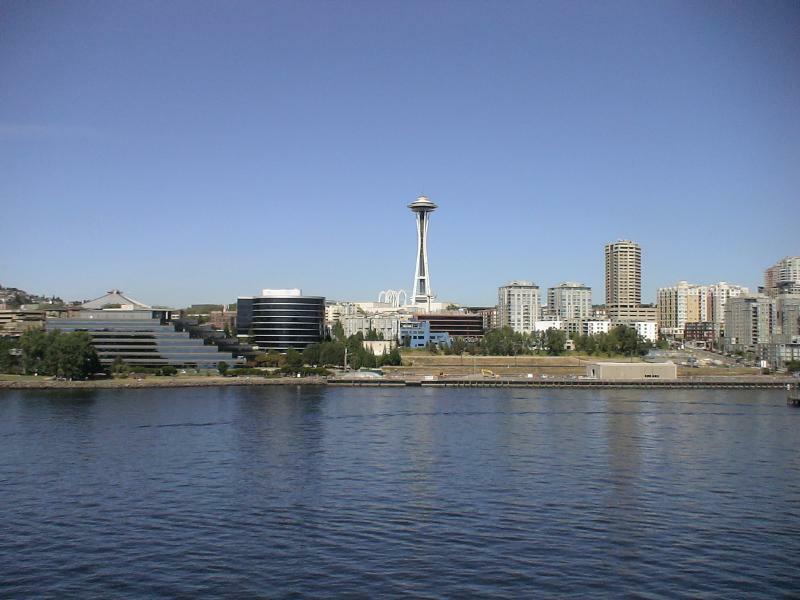 This is a look at the skyline of Seattle and the Space Needle as we left port. This is probably my favorite picture of the entire trip. This is Mt. Rainier east of Seattle. From this vantage point, the ground haze makes the mountain look as if it is floating above the city. I am told that the peak of Mt. 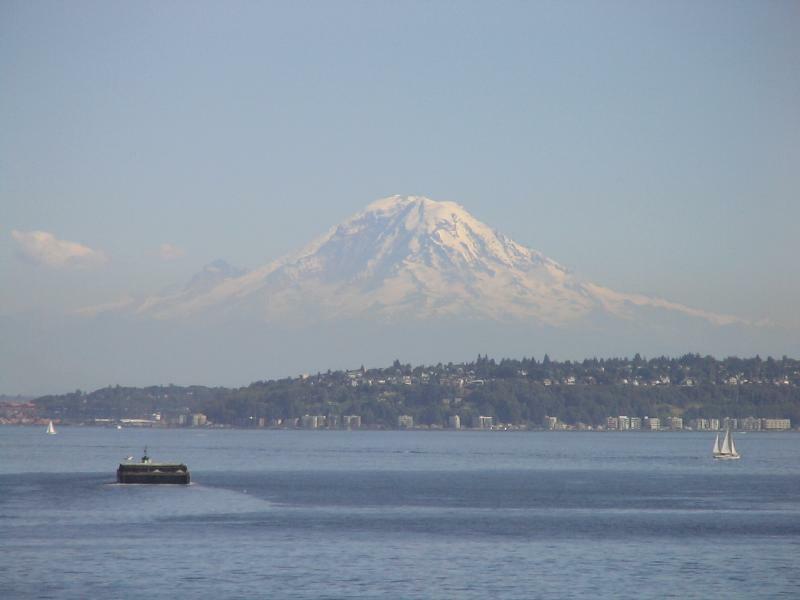 Rainier is actually over 120 miles east of Seattle. 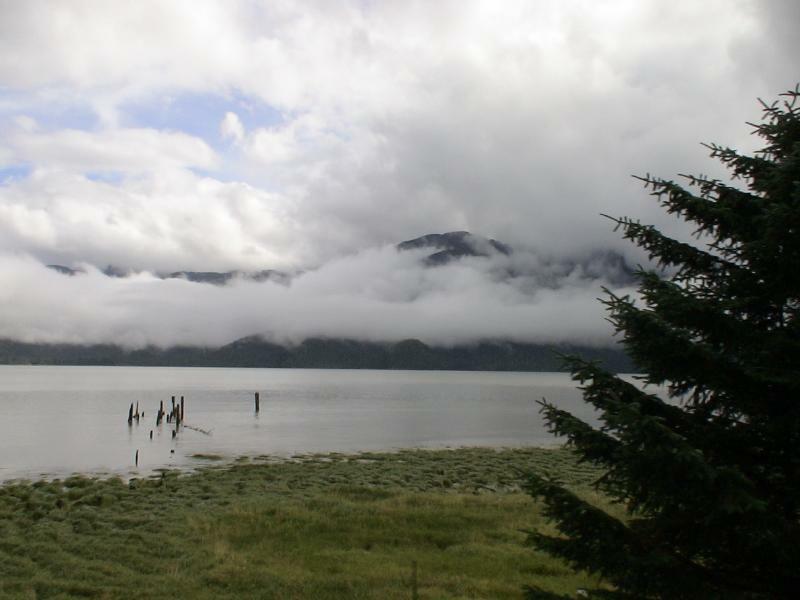 We woke up the next morning to an eerie fog over the water. 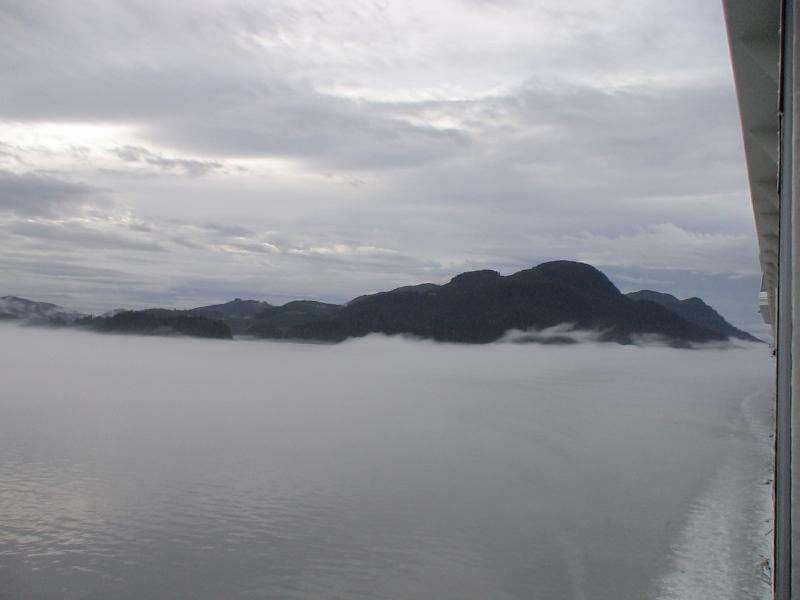 This picture is taken along the eastern side of the passage which is the western Canadian coast. 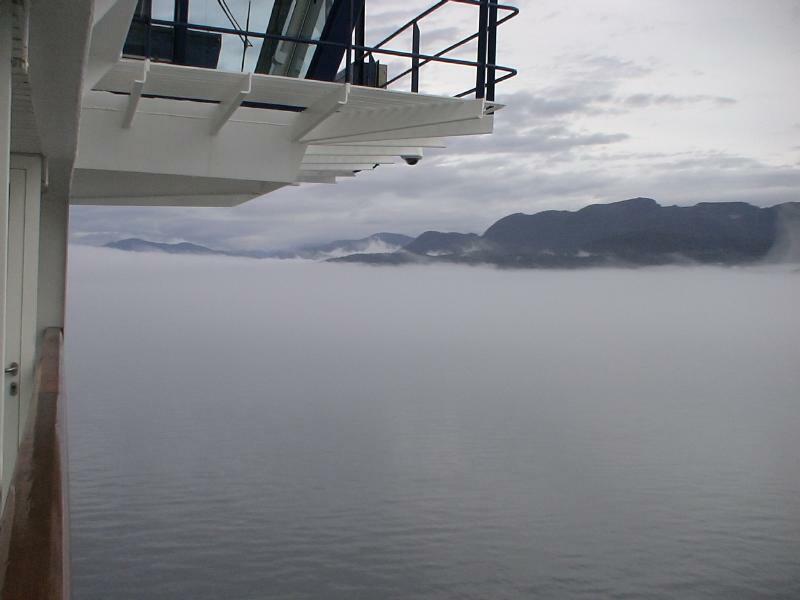 It is very eerie feeling to be sliding almost silently through the water in these fog banks. 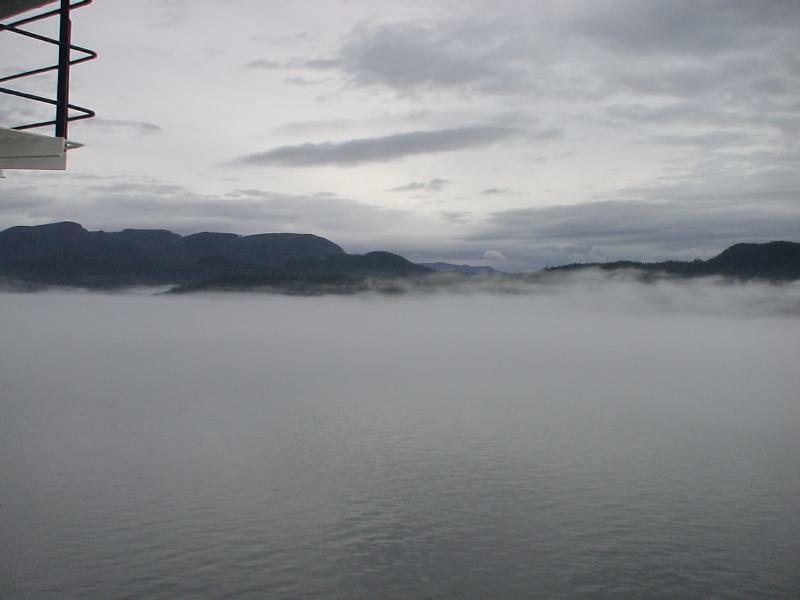 This picture shows how the fog settled between the hills and the water. It changed from minute to minute. The structure at the top of the picture is the Flying Bridge that the captain used when steering the ship in port. We were so close to this Flying Bridge that, in the evening, we could sit on our balcony and read the instrumentation for speed, direction and depth on the bridge. 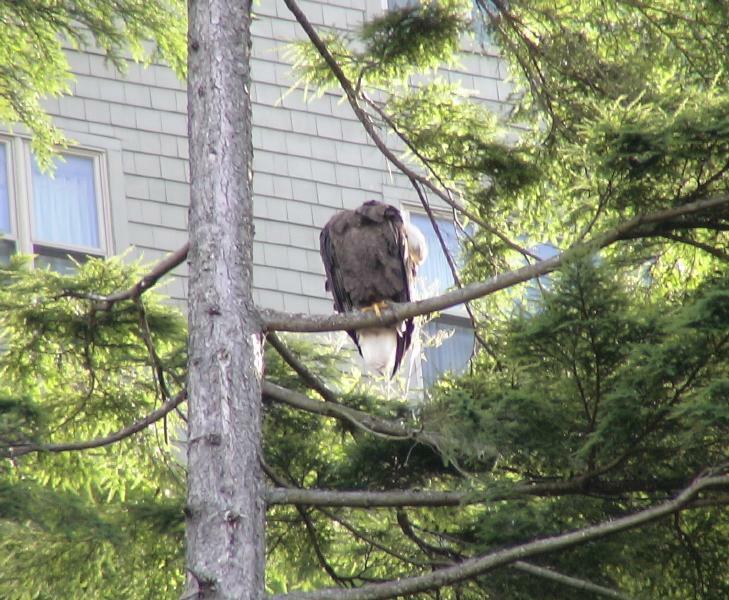 At Ketchikan we happed upon two American Bald Eagles in a tree along a creek that was essentially in downtown Ketchikan. 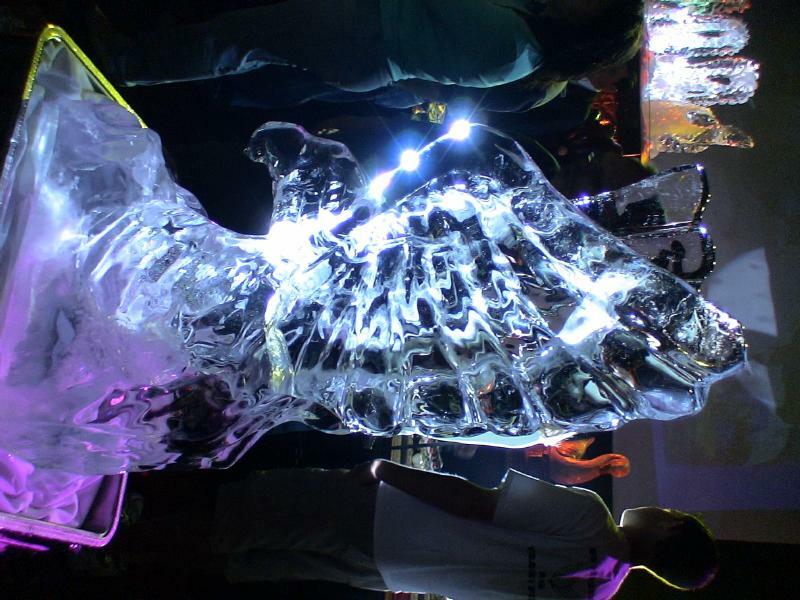 This is a picture of one of the birds preening itself. I shot a 2 minute video of these magnificent birds that also catches one of them giving its distinctive call. To watch the video and hear the call, run the mouse over the black screen to the left. This is Connie being mauled by a ferocious polar bear. Well, not really. 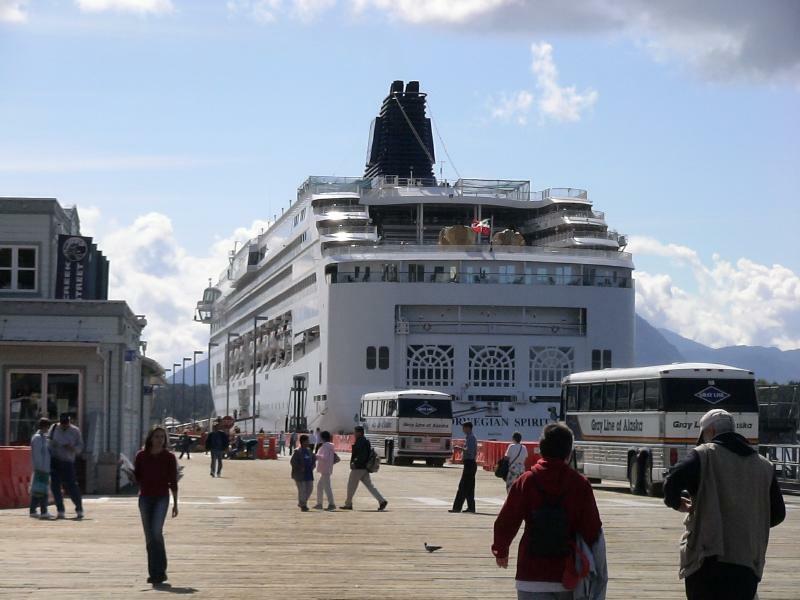 I was trying to capture an idea of the size of our cruise ship, the Norwegian Spirit, in port at Ketchikan. A picture doesn't do it justice. This ship is 880 feet long, 108 feet wide, and over 160 feet above the water line not including the exhaust funnels. 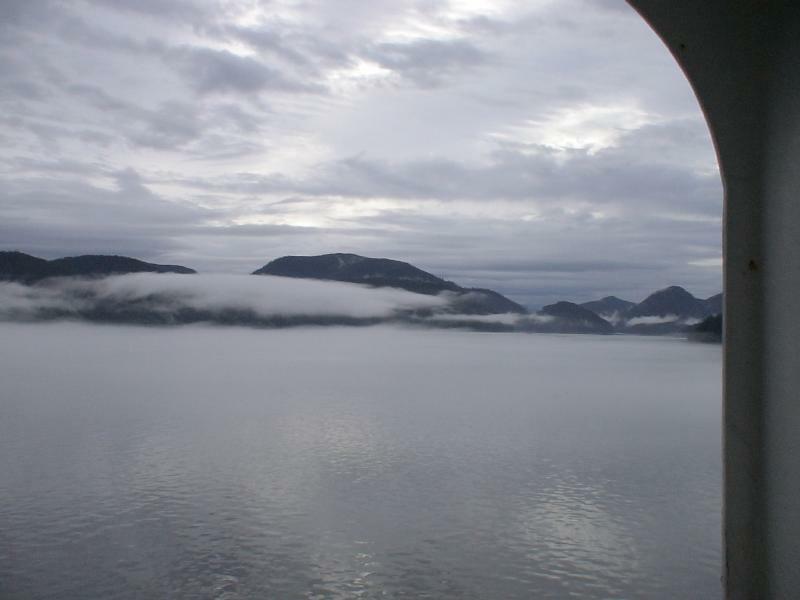 Leaving the harbor at Ketchikan. You can see one of the other cruise ships anchored in the harbor. 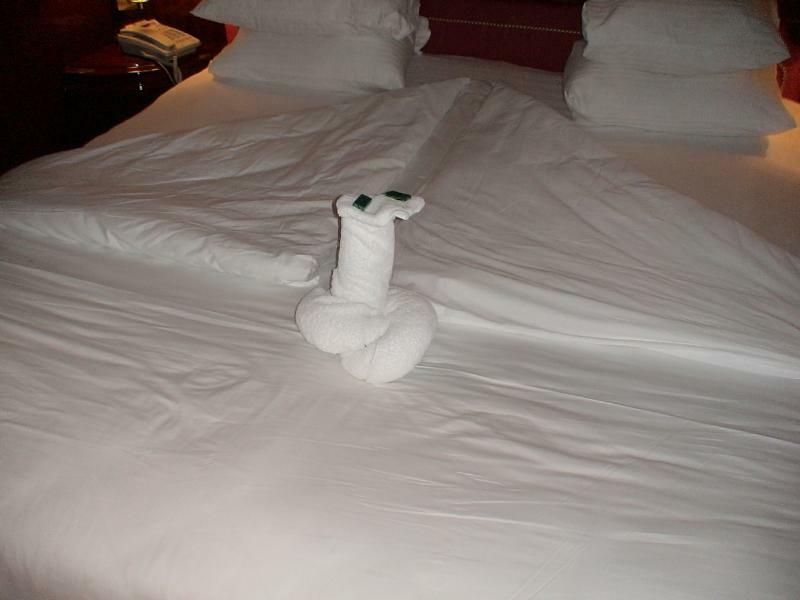 One of the customs aboard a cruise ship is for the room steward to fold towels into the shapes of animals and place them in the passenger's rooms. We found this one on our bed one evening. It is a cobra with chocolate mints for eyes. The 'cobra' would wiggle as the ship moved. 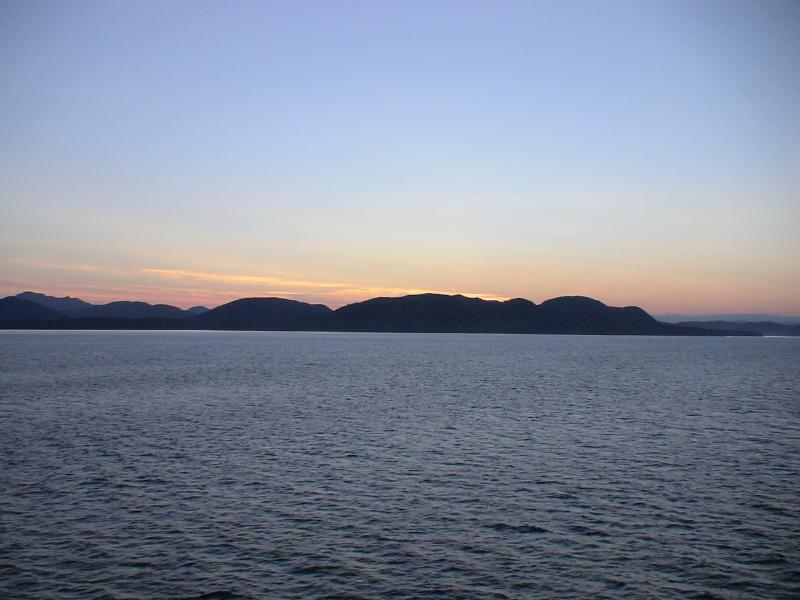 Leaving Ketchikan and sailing on to Juneau, this was a spectacular sunset. 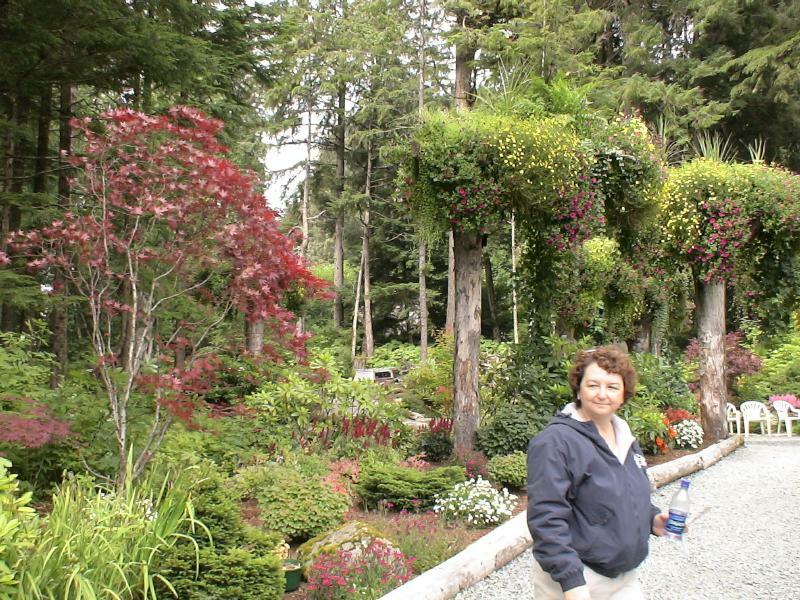 In Juneau, we toured an arboretum. The owner had a problem with trees becoming so tall that they literally fell over. Because the soil is so shallow above the bedrock, there is not much for the trees to anchor to. So he would take the fallen trees, top them out, flip them upside-down and put them back into the ground with the roots point up. In the root area, he would plant flowers and hanging vines. 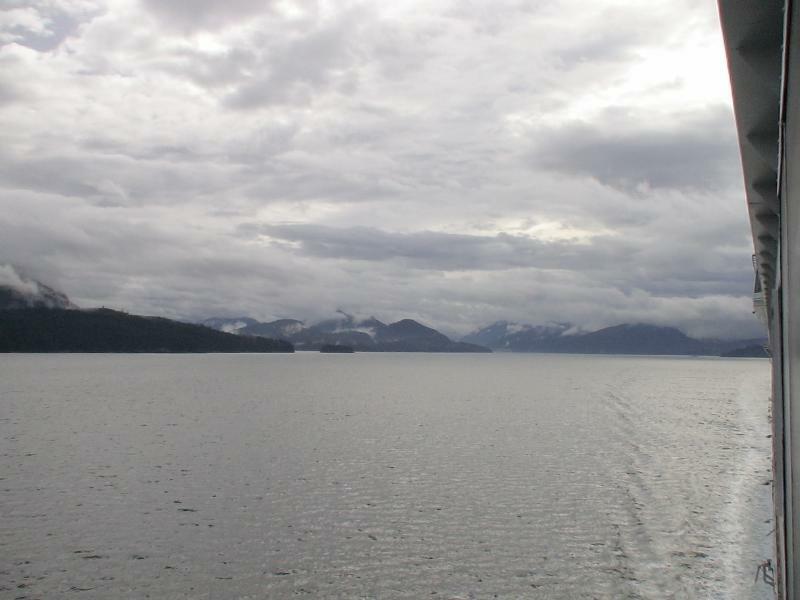 This is the western coastline of the inside passage as we started our way to Skagway. 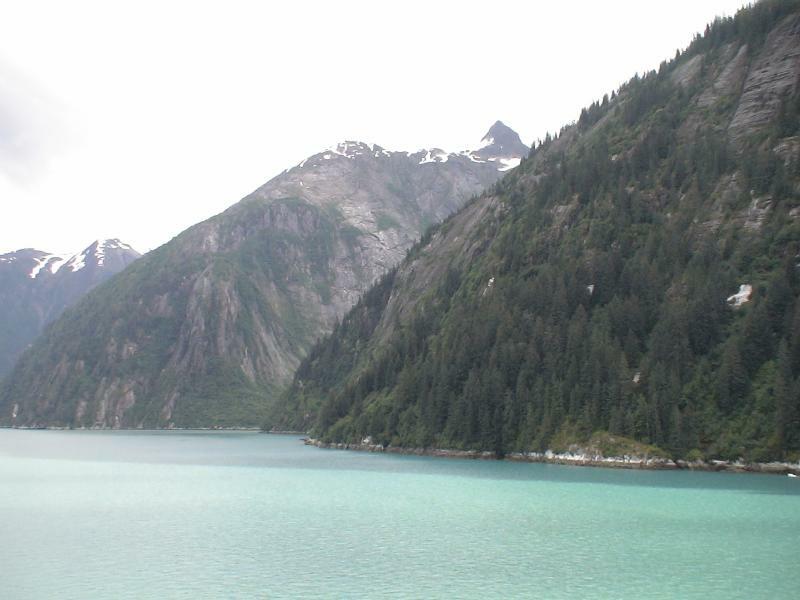 This is the inlet to the Sawyer Glacier area. 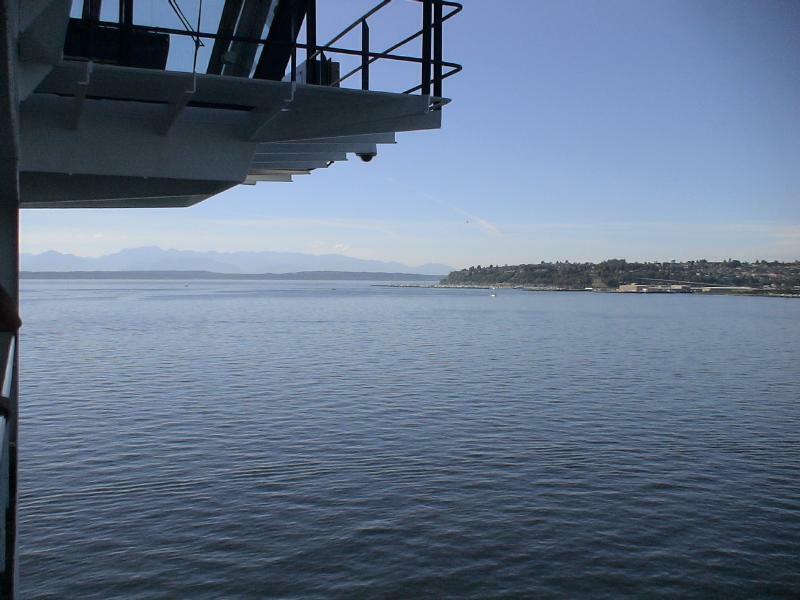 The channel was only about five times as wide as the ship itself and made for some white knuckle moments when the ship had to make sharp turns. 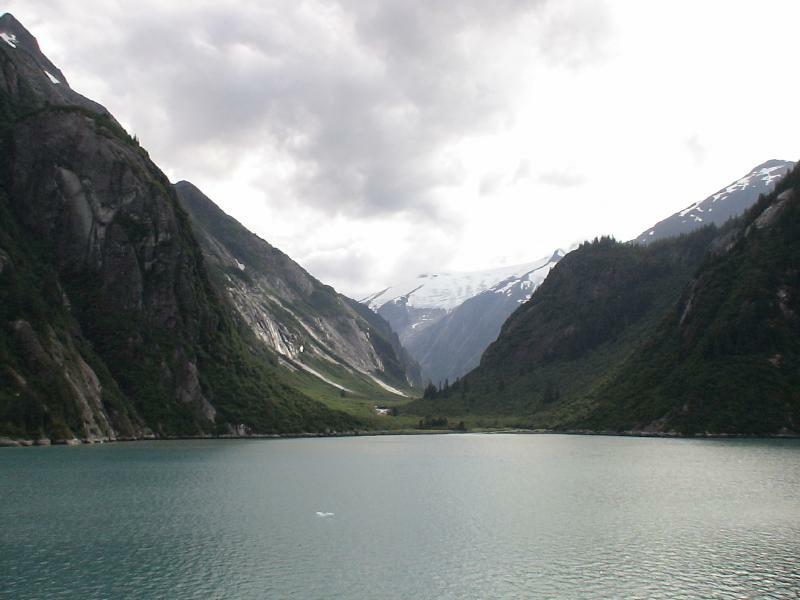 These spectacular gorges between the mountain peaks are the site of previous glacier activity from thousands of years ago. 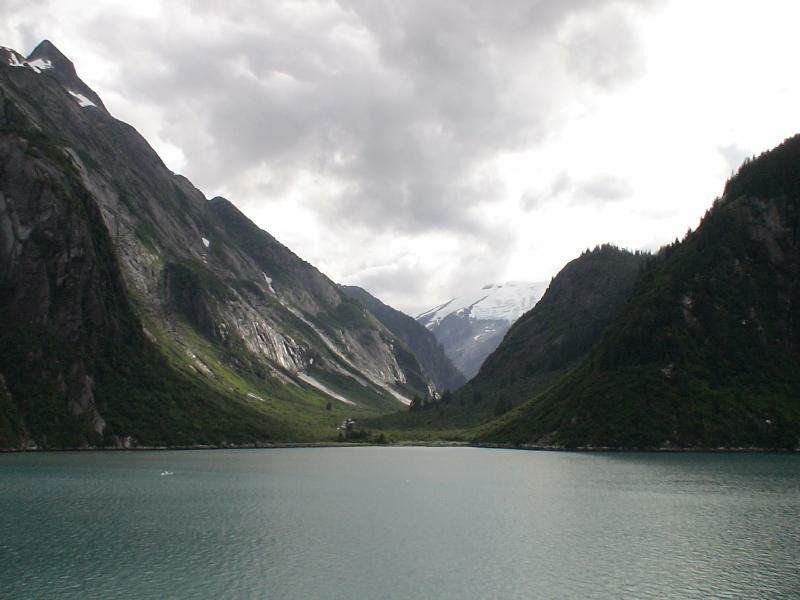 We passed dozens of these gorges on the way up the channel to the Sawyer Glacier. 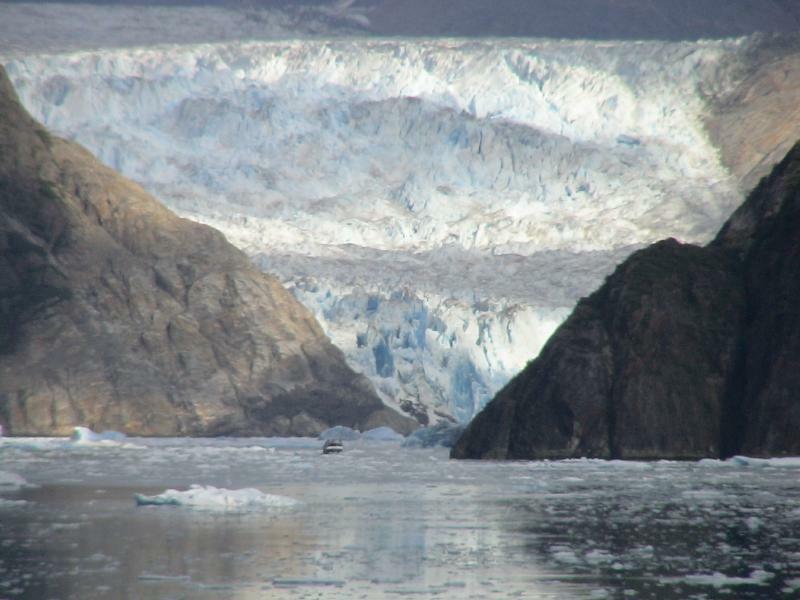 This is the east side of Sawyer Glacier from about 5 miles out. This is the east glacier from about a mile away. 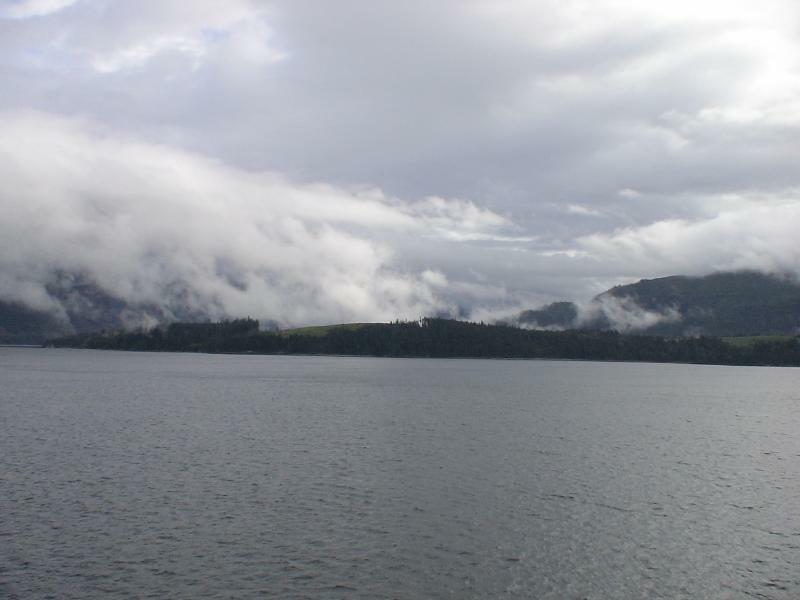 Notice the small boat just to the left and below the center of the picture. The boat is probably 50 feet long. 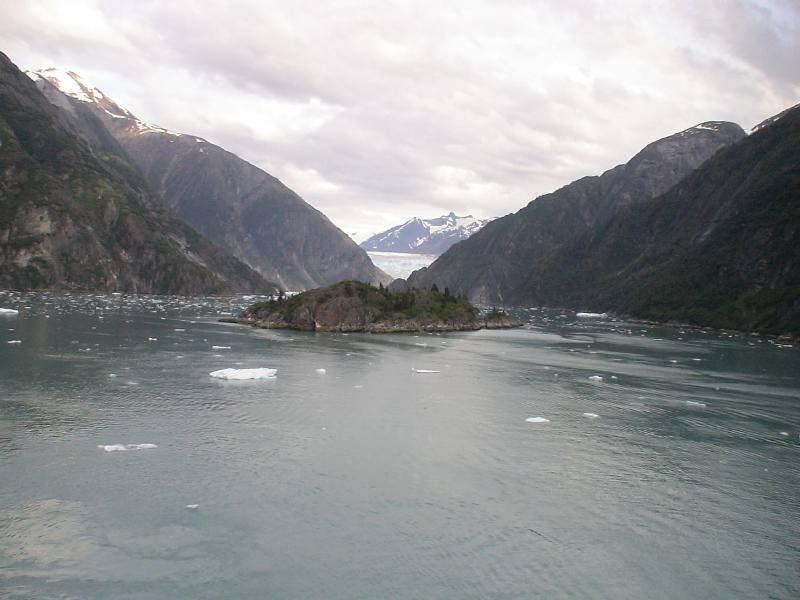 Several of the cruise passengers from our ship went on this excursion boat that took them to the foot of the glacier to watch it calve chunks of ice into the channel. 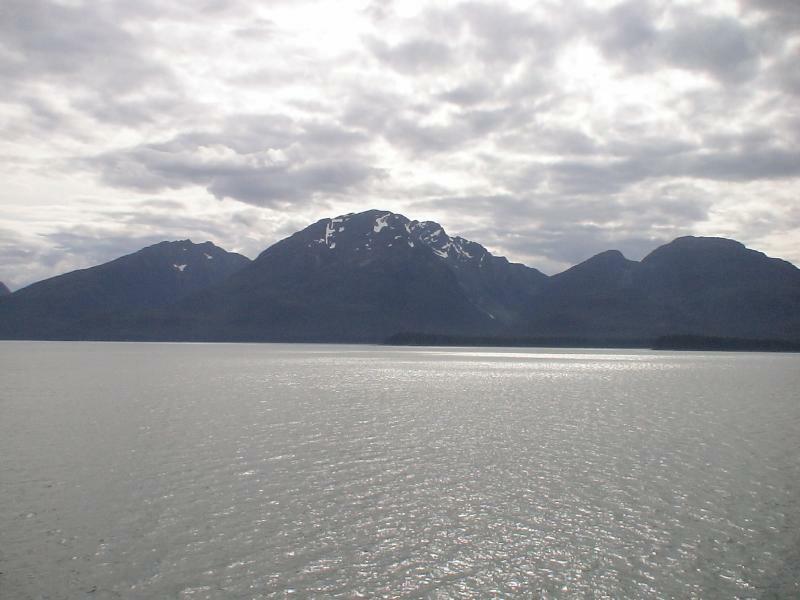 This is the west glacier from about 2 - 3 miles away. The west glacier again but through a telephoto lens. 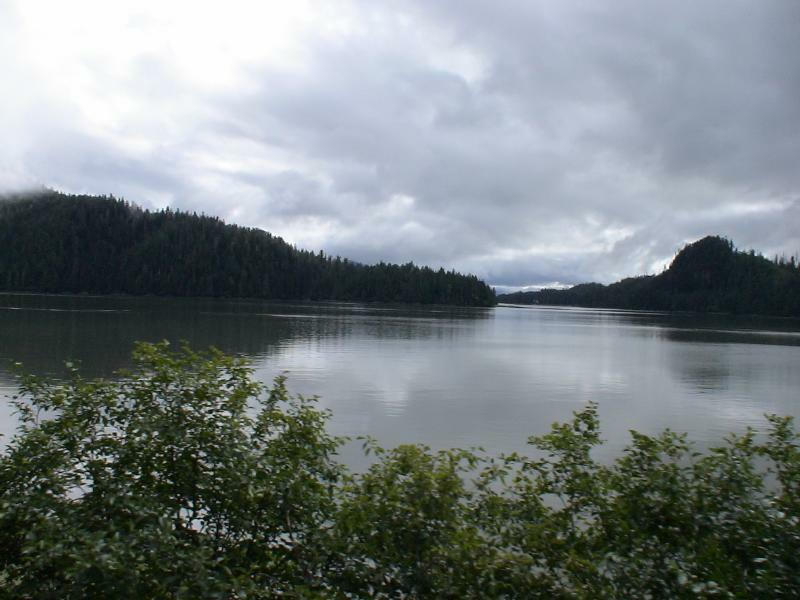 We took a train ride tour on a steam locomotive in Prince Rupert. 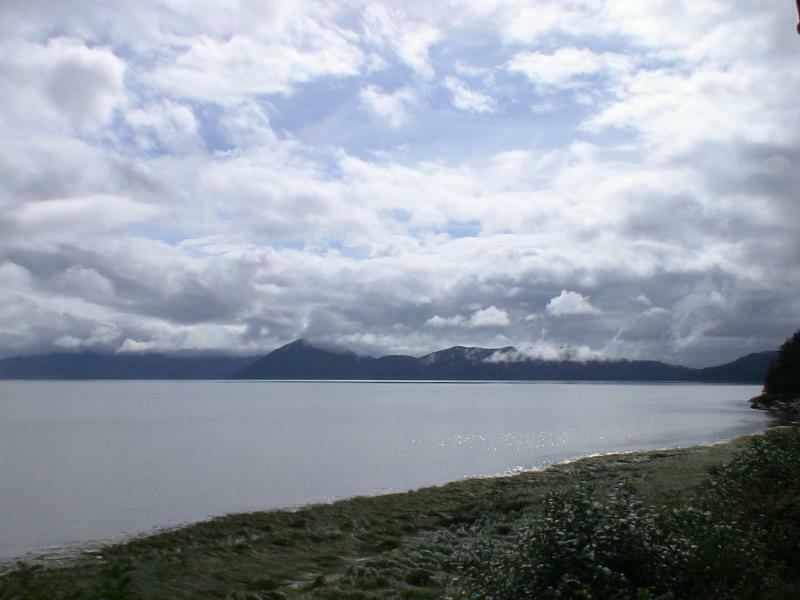 The ride followed the shoreline past several abandoned canneries. 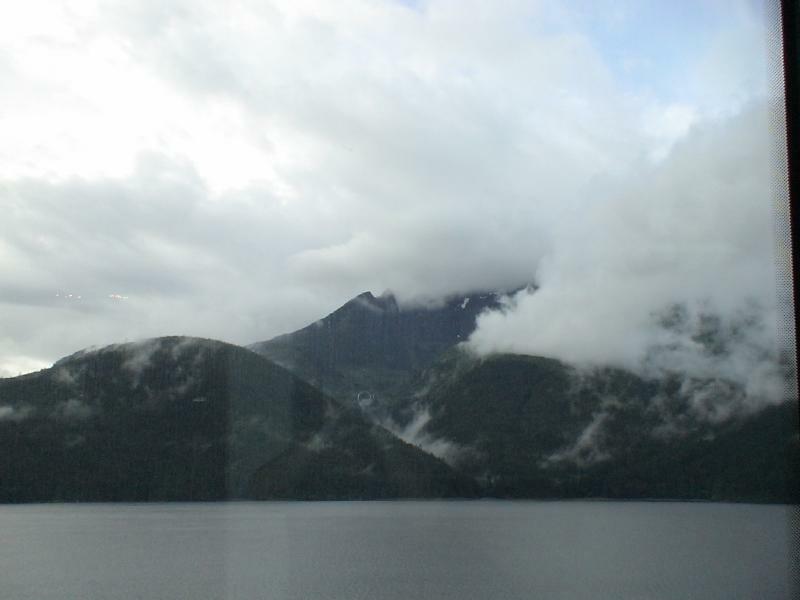 There was lots of fog/clouds surrounding the mountains in the area. 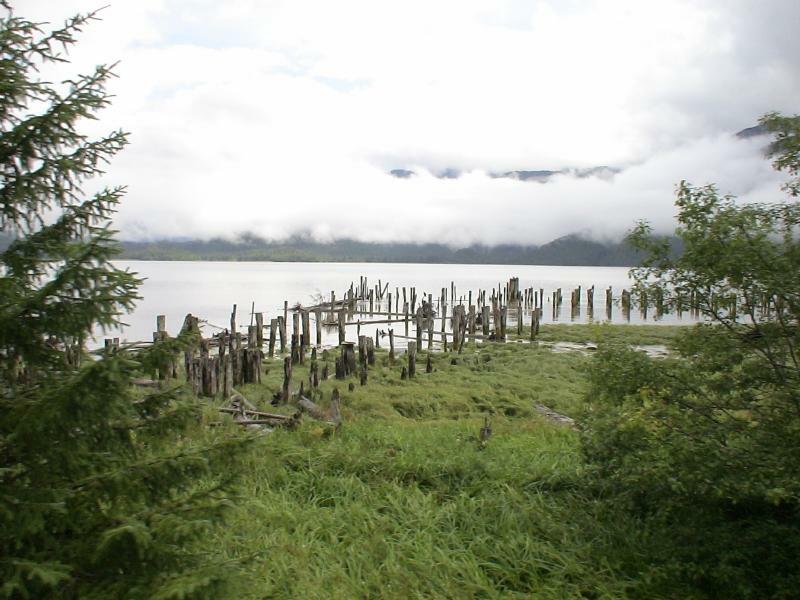 These are dock pilings from an abandon fishery. This is pig weed. 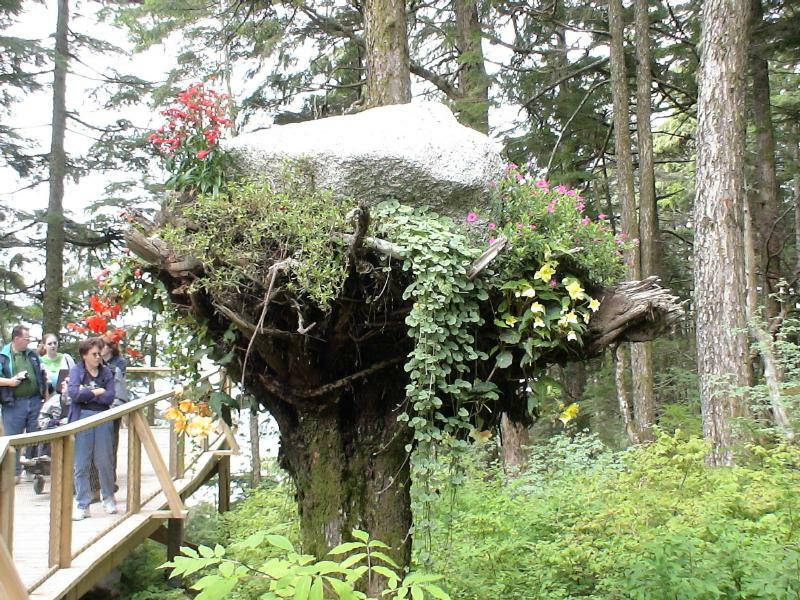 It grows everywhere in Prince Rupert. 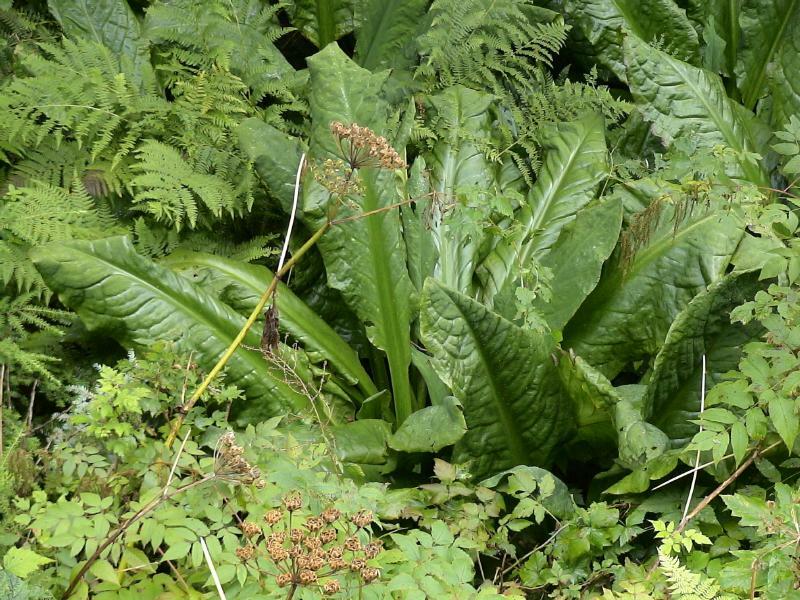 The locals say that it has medicinal usage. Out train had an open observation car. 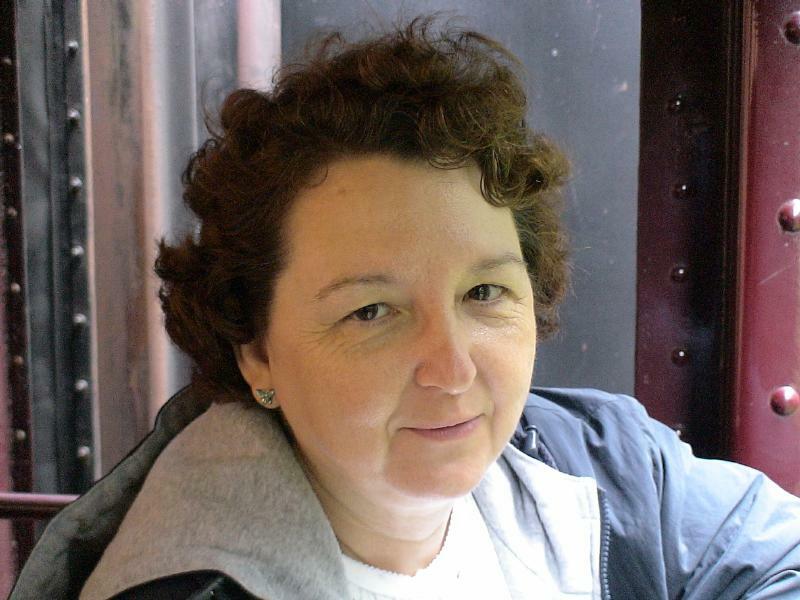 After about 10 minutes out in the cold wind, Connie was ready for the enclosed passenger car again. The passenger cars were heated with wood stoves! 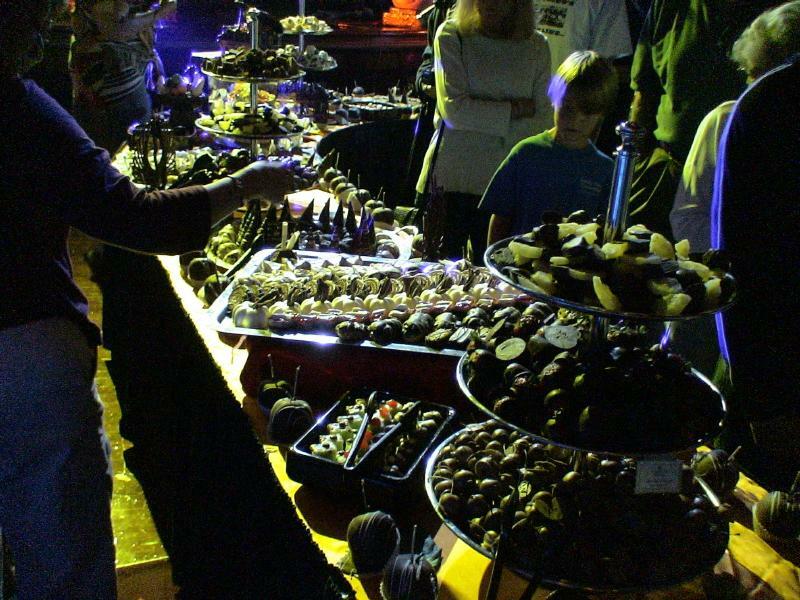 All of this candy was distributed to the passengers if they stood in line after the display period. We decided tht our diet would suffer too much, so we went back to our cabin rather than wait for samples. When be entered our cabin, we found that our butler had put a tray of the chocolate on our table....so we ate them! You can't argue with fate! 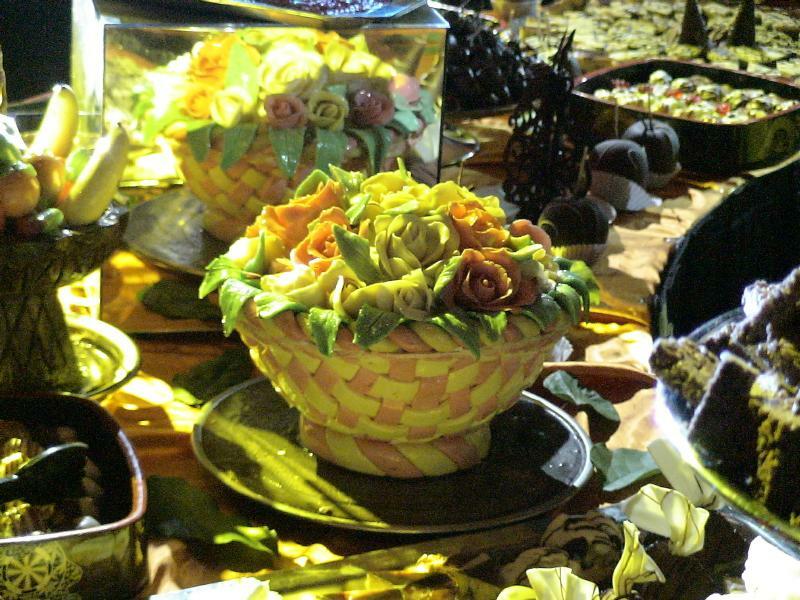 This is a floral centerpiece made form sugar frosting. 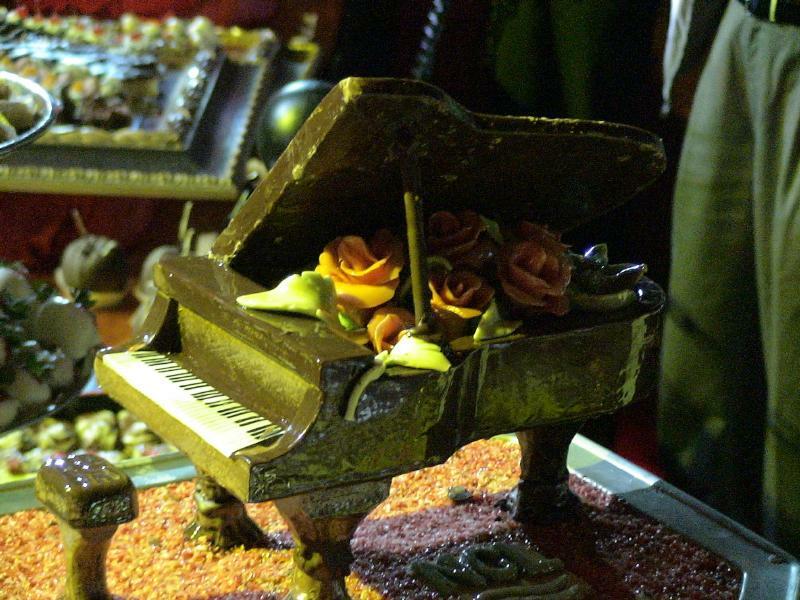 This is a miniature piano filled with flowers. It is made completely from chocolate, caramel and icing.